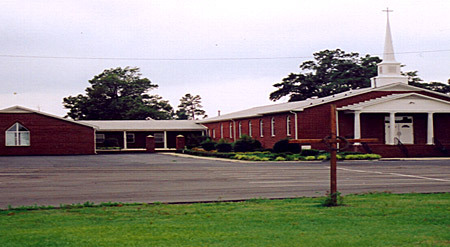 White Plains Baptist Church received its name from White Plains Farm, which is located in lower Mountville, South Carolina, the area in which it is situated. The first services were held under a Brush Arbor on the land of a white Doctor, John Nickels Wright. It is possible that these services were held between 1865 and 1872. White Plains Baptist Church was organized in 1872 with eleven members, two deacons (S.S. Simpson and Josiah Henry), and Rev. J.S. Sanders as Pastor. In 1875, Mr. Charlie F. Mosley gave a piece of land to Richard and Eliza Wright on which to build a church. The first building was believed to be a log building and after two renovations stood a 30 x 50 structure. In 1906, after about 34 years in the old building, it was rebuilt under the leadership of Rev. M.A. Cunningham. The new structure was a one wing, two towers, 40 x 54 building. Between 1922 and 1927, the church was enlarged under the leadership of Rev. G.W. Watson. The old church stood for 52 years. In August of 1958, services were held for the first time in a new building under the leadership of Rev. M.C. Duncan. Under the administration of Rev. U.D. Vernon, additional rest rooms, a kitchen and educational department were added. Rev. L.V. Johnson, elected in 1970, put into action plans to renovate the sanctuary. In 1978, during the tenure of Rev. S.M. Johnson, these plans were completed in addition to a newly paved churchyard. In 1993, we as a church family are honored and blessed as God saw fit to send us a vessel (Dr. Johnny L. Johnson,Jr.) with tremendous vision and outstanding perception of what the Lord wants for this house. Not only have we grown spiritually, we have grown in knowledge and in number. Under Dr. Johnny L. Johnson's administration our church has undertaken grave renovations to the structure and sanctuary as well as brought us into the 21st. century by way of ministry, training, communications, media, and computer science, just to name a few. Pastor Johnson has held the longest tenure as Pastor in the history of the White Plains Baptist Church. To date it has been 22 years and it is our prayer that God will continue to bless and keep us under his leadership.